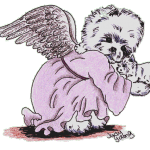 Marlene said that their ears were totally flat on their heads and their tails were matted right to their bodies. But they did not have worms or even ear infections. They seemed pretty healthy. But because the girl was clearly having urinary problems, I made a vet appointment for Monday afternoon. She was peeing excessively until Monday and then she wasn’t able to pee much at all even though she tried very hard to do so. Because they had no known names, I was able to give them names myself. (They were only able to tell us that the lady called the girl “little boy”!!!) I gave them nicknames of Tiger (the boy) and Sprout (the girl) so that I can address them. Their final homes can give them real names. Both dogs are the nicest little Westies you could hope for. They crave attention and love to sit on your lap. Sprout is a tiny 13.4 pounds and also somewhere between 6 and 10. It turns out she has a bladder FULL of stones. She probably had an infection too so she is now on Clavamox. She will have surgery next week for the bladder along with a dental cleaning and spaying. Once he checked her over and palpitated, she did pee and it was quite bloody so I don’t want to put that surgery off any longer than necessary. I know she is hurting. Both dogs were very timid and scared during the first few days. Sprout would sit on the back of the couch and you could see her whole body shudder on each inhale. The only time she didn’t shake was when she was up and walking around but because she didn’t feel well, she mostly laid on the couch. Tiger didn’t seem nearly as scared UNTIL we had company. 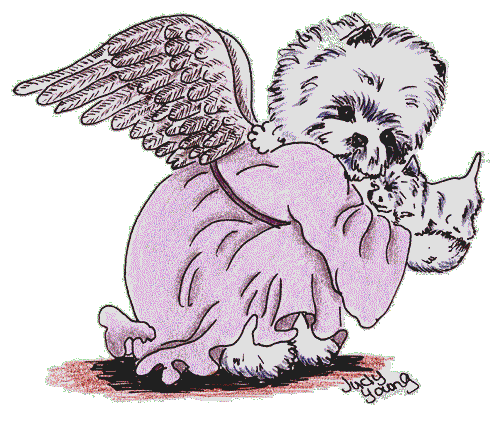 When Peg came to visit, he barked and howled and carried on something awful. 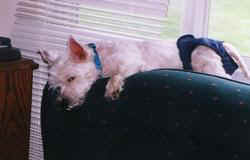 We began a routine recommended by Trainer Deb Duncan (from the Westie Club of America – National). Peg would come over. We would block off all exits so Tiger was forced to stay in the room with us. I would sit in a chair and put my legs up so he couldn’t use me for security. Peg would sit on the floor with treats in her hand (in his case, a can of Innova Dog Food worked best). Peg and I would talk and not pay him a lot of attention. Eventually, he would eat some of the treat. Finally he would lick it off her hand. After a couple of days, he would let her pet him. And then, when she would stop petting, he would shyly put his paw out and touch her to ask her to pet him some more. For Sprite, it came along a bit more quickly. She would allow herself to be held and petted but she continued the shaking for a longer period of time. Peg’s husband came over and later her college-age kids stopped by. Eventually both dogs became much more tolerant of strangers. On the fourth day, Sprout was feeling a bit better. This was evident by the fact that her pants needed changing much more frequently as she was finally able to pee more freely. While there is still a lot of straining, this is due to the stones and not to the infection. The stones give her a feeling of pressure which makes her want to strain and push. On Thursday Sprout came and joined the rest of us in the family room. Molly sat on my lap, Tiger on the stool by my feet and Sprout joined us by sitting by my side. When Molly got up and left, Sprout climbed up and curled herself into my lap. And on Friday morning, for the first time, Sprout was there in the kitchen waiting anxiously for breakfast along with the other Westies. Her crate was wet this morning which will be bad news for housebreaking but great news with regard to a clearing bladder infection. Later in the day, I used the hand-held vacuum. Molly has been teaching Tiger that vacuums need to be attacked and killed and Tiger is a very good student. Now, Sprout got down on the floor and joined them. She didn’t attack but she watched the action very closely. She is getting more active all the time. – Removal of a cyst on her back She came home and was immediately obviously better. She doesn’t seem to need the diapers any more. Tiger has begun going for walks and meeting more people. He still has a hard time meeting people but settles down more quickly now than before. He kind of trembles in fear while out walking but he likes to do it.I know because of how excited he gets when I put my shoes on. He does pretty well on the leash but I hope, soon, he will figure out that he doesn’t have to walk between my legs!!! His house training is going well. He is down to only one accident a day and he knows when he has done wrong. Soon he should be reliable. Tiger and Sprout are now living happily together out on the east coast. 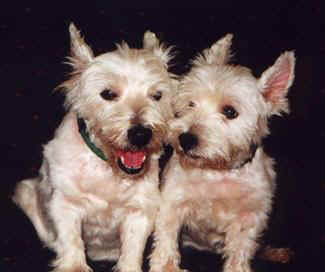 They were adopted by an experienced Westie family whose Westie had recently died. In fact, when the potential adopter came to visit them, they “adopted” her!! They went to her and Sprout was in her lap within two minutes!! Tiger wasn’t far behind. And a third Rescue who is 13 years old approached the lady and began to give her kisses. All three went home with her!! Thank you to everyone who helped out with support and donations!